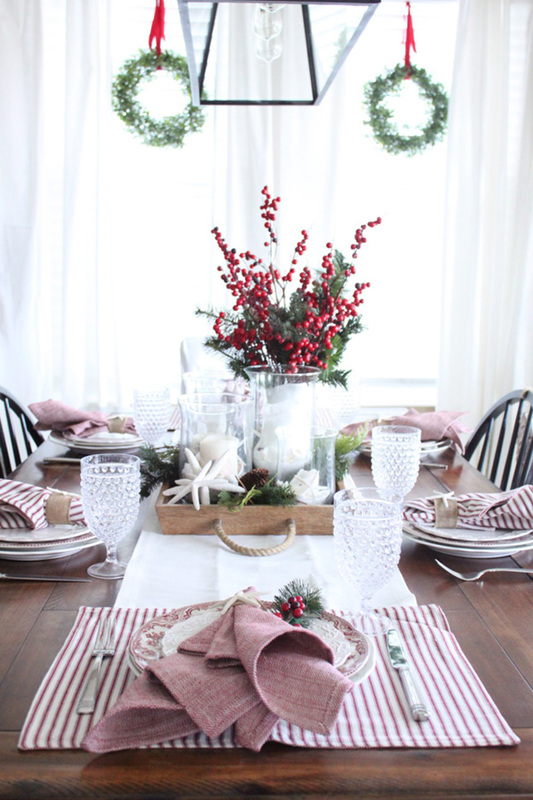 We have another lovely tablescape that we wanted to show you from our Blog hop and this one’s a nautical Christmas tablescape from A Starfish Cottage. We just love the nautical inspired details that she used on her table. First off, look how much light comes into her dining room. Jealous! It’s so light and bright yet so intimate. We love the hanging evergreen wreaths that she has over her windows. Of course she used starfish in the best way throughout her tablescape. The cute little starfish napkin rings. The starfish accents on the centerpiece, so lovely! We also love the vintage milk glass goblets. They add such a charm to the table. The place mats are everything lovely about nautical with a fun Christmas tie in being red stripes. We love the off red napkins to match with the little starfish napkin holder. It’s finished off with some evergreen and some winter berries and looks so festive. That same look is carried on into the centerpiece and we love everything about it. It is simple and chis. Just a few candles in some hurricane glasses on a wood tray with a rope handle and it’s perfect. Add in those lovely winter berries and the evergreen and you have a to die for Christmas look. The black steel chandelier is just the cherry on top!